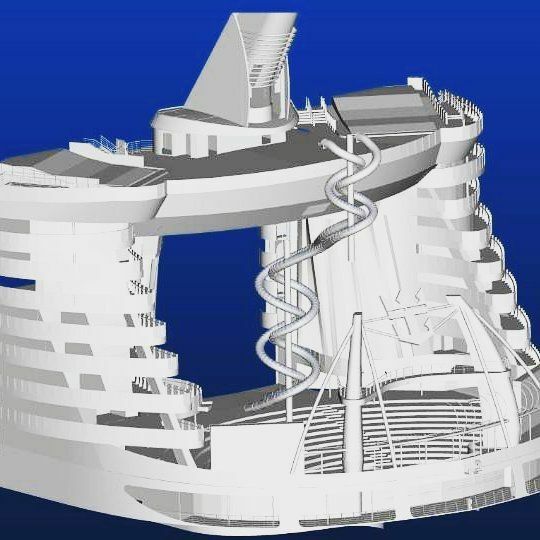 Could This Be The 10-Story Slide On Harmony of the Seas? Cruise News Royal Caribbean Could This Be The 10-Story Slide On Harmony of the Seas? A rendering has been leaked online of Royal Caribbean’s upcoming cruise ship Harmony of the Seas. This isn’t just any rendering but that of a possible 10-story water slide. The cruise line has not yet released any images of the 10-deck Abyss water slide but what we do know is that The Abyss will be one of the most thrilling water slides at sea. The rendering is not that accurate and could possibly be an early design element when the ship was in the early design phase. The Abyss will begin from 10 stories above the AquaTheater on deck 16 and head all the way down to the boardwalk at the back of the large cruise ship. The rendering seems to have come from an instagram user and is also doing the rounds on the Cruise Critic message boards. Royal Caribbean revealed details on the Abyss and other slides known as “Perfect Storm”. these details were released just weeks ago and more news about them are expected in the near future. The cruise line still has to reveal officially renderings of the large water slide along with further details. You can read Royal Caribbean’s announcement about the onboard water slides right here. Harmony of the Seas will be 227,000 gross tons and will carry 5,479 guests at double occupancy. The ship is currently being built at the STX shipyard in Saint-Nazaire, France. The ship will become the world’s largest cruise ship when it enters service in April 2016.